I took a chance with this one, stepping outside my comfort zone to explore new techniques & a freer style of painting. I have to admit that I’m pleasantly surprised. Not all of my experiments go well- that’s what makes them so exciting. But when they do, it makes up for the many that don’t. Besides, is any experiment ever a failure? Or, is the failure in not taking the risk in the first place? Monks Walking gently reminds me to be present & mindful. 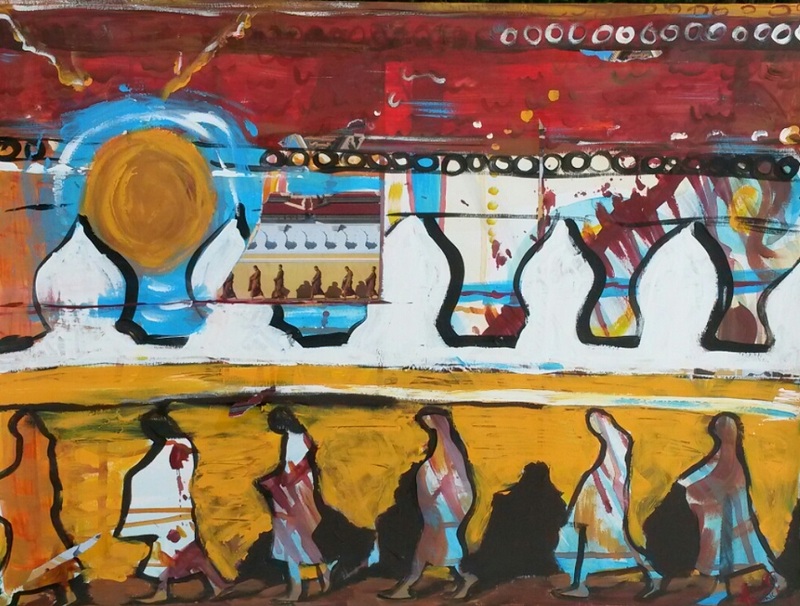 Monks Walking is an original collage on 18 inch by 24 inch mixed media paper. If you look closely, left of center is a small section of the magazine picture that inspired my piece. I love the bold colors, strong natural sunlight, and exotic architecture in the photo- so I used similar colors and painted enlarged versions of the patterns and motifs with loose brushstrokes, creating a piece both strong and contemplative. Notice the intent focus of the Buddhist monks on their simple act of walking, reminding each of us to focus on the present moment and be mindful of every step we take. This entry was posted in A Window on Life, Art and Soul, It's All Connected: Spiritual Musings and tagged art, Buddhism, collage, health, life, mindfulness, monks, reflection, self-awareness, spirituality by puresusan. Bookmark the permalink. Well done Susan! Looks great! Thanks. .. it was fun to relax and just play…without over-thinking it.